Put the oven rack at the lowest position and preheat the oven to 400 degrees. In a good quality saucepan, bring the butter, water, milk, salt, and sugar to a slow boil then turn heat to low. Add the flower and stir until combined. Move the flower mixture to a stand mixer and add cinnamon then each of the 5 eggs one at a time, mixing until well combined between each egg. Line muffin tins with cupcake papers (remove the paper liner and just use the metallic part), lightly pray each paper with the cooking spray. Drop two tbs of the dough into each cup. Mix the next 4 ingredients together in a small bowl. Add 1 tsp of the sugar mixture to the top of each dough filled cupcake paper. Bake until the top of the cupcakes have puffed completely, about 30-33 minutes. Remove from oven and allow to cool completely. Put the butter and the chili in a saucepan over medium low heat and heat until hot but not boiling, stirring constantly for about 5 minutes. Remove from heat and allow to steep for 20 minutes, then strain the butter removing the chilies and discarding them. Put the chocolate and the coffee in the top of a double boiler and heat until the chocolate is melted. Stir in the strained butter until well combined and then set aside. In a double boiler, beat the eggs yolks, chocolate liqueur and ¾ cups of sugar beat until the mixture is pale yellow and well combined. Remove from heat and continue to beat until thickened and cooled. Slowly add the chocolate mixture to the egg mixture and stir until well combined. Beat the egg whites until soft peaks form, then slowly add the 2 tbs sugar and continue to beat until stiff peaks form. Gently and slowly fold the egg whites into the chocolate mixture using about ¼ of the egg whites at a time. Cover the mousse and chill for at least two hours. While the mousse is setting, make the whipped cream. In a sauce pan, heat the chili and the cream until hot and steamy but not boiling. Stir over low heat for about 5 minutes. Remove from heat and allow to cool at room temperature for 30 minutes. Strain cream, removing and discarding the chili, and then chill in the refrigerator until completely cool, at least two hours. Combined the cream, sugar, cinnamon, nutmeg and coco powder in a bowl and beat on high until set, about 4 minutes. Set aside. Gently spoon the mousse into a piping bag with a metal tip. Most of the cupcakes should have holes in the top, revealing a large cavity in the center of the cupcake (like a popover). If no holes appear, make a small slit in the center. Pipe in the mousse into the center of the cupcakes, filing the cavity, refill the piping bag as needed. 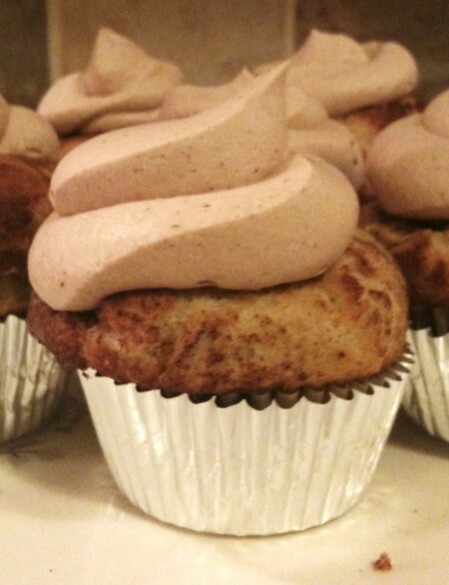 Top cupcakes with the whipped cream. These cupcakes look so delicious! Thanks for sharing.